From the author of the New York Times bestseller Garden Spells comes a beautiful, haunting story of old loves and new, and the power of the connections that bind us forever….The first time Eby Pim saw Lost Lake, it was on a picture postcard. Just an old photo and a few words on a small square of heavy stock, but when she saw it, she knew she was seeing her future.That was half a lifetime ago. Now Lost Lake is about to slip into Eby’s past. Her husband, George, is long passed. Most of her demanding extended family are gone. All that’s left is a once-charming collection of lakeside cabins succumbing to the southern Georgia heat and damp, and an assortment of faithful misfits drawn back to Lost Lake year after year by their own unspoken dreams and desires.It’s a lot, but it’s not enough to keep Eby from calling this her final summer at the lake, and relinquishing Lost Lake to a developer with cash in hand. Until one last chance at family knocks on her door.Lost Lake is where Kate Pheris spent her last best summer at the age of twelve, before she learned of loneliness and heartbreak and loss. Now she’s all too familiar with those things, but she knows about hope, too, thanks to her resilient daughter, Devin, and her own willingness to start moving forward. Perhaps at Lost Lake her little girl can cling to her own childhood for just a little longer…and maybe Kate herself can rediscover something that slipped through her fingers so long ago.One after another, people find their way to Lost Lake, looking for something that they weren’t sure they needed in the first place: love, closure, a second chance, peace, a mystery solved, a heart mended. 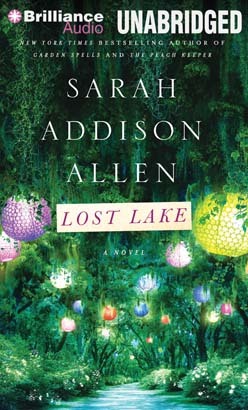 Can they find what they need before it’s too late?At once atmospheric and enchanting, Lost Lake shows Sarah Addison Allen at her finest, illuminating the secret longings and the everyday magic that wait to be discovered in the unlikeliest of places.